News of Internet insecurity are lowering user’s trust in Internet based service, including digital libraries (Kuzma, 2010). Information security is a big issue in digital preservation. Information security issues can be generally divided into three categories: (1) system security, (2) collection security and (3) the legal and regulatory aspects. System security means preventing the information infrastructure; Collection security refers to no loss or change of the content; Legal and regulatory aspects address personal or confidential information related in the digital items and services (Digital Preservation Coalition, n.d.). So, what else can digital librarians do to weaken the risks of information security in digital preservation? First, System security is the basic requirement for digital libraries surviving. Both hardware and online platform holding the digital resources should be secure enough to make sure the long-term preservation and protecting items from attacks or loss. I had a sad story on preserving items on the Internet. I used to have a blog which I used as a personal information infrastructure. I wrote diaries and saved most of my photos on it. After I went to college, I seldom used the blog. Five years ago, I found that my blog disappeared. This blog website was obsolete. The owner company decided to close the website. I lost all my stuff preserved on it!!! That was why I said digital preservation is by no means safer than physical preservation in my first blog. Therefore, choosing a reliable information infrastructure is extremely important. In addition, digital librarians can do regular data preservation and backups to against data loss (Anday et al., 2012). Second, access control is critical to ensure collection security. The NDSA levels guidelines on information security touch this point directly. In the first level, recognize who has read, write, move and delete authorization to individual files and restrict who has those authorizations to each file. In the second level, write down access restrictions for content. In the third level, maintain logs of who performed what actions on files, including deletions and preservation actions. In the fourth level, perform audit of logs (Phillips, 2013). In the process of digital preservation, the administrator set up the access control in the infrastructure system, and digital librarians log into the system with limited authorization. This is a good way to clarify responsibility and avoid mistakes that may threaten content security. Another important method to protect collection security is identification and authentication of users. Users of digital libraries can be asked to register an account with an authentic ID and log into the websites before they use resources. This can protect digital items from unauthorized access. For example, digital librarians can set up that some digital items holding confidential information are inaccessible for unauthorized users. In conclusion, in order to protecting system security, digital libraries and librarians should choose hardware and online platform with good quality and at the same time remember to do regular data preservation and backups. Also, authoritative access control in the process of creating and managing the data and information and identification of users are good ways to protect collection security. In addition, digital libraries should ensure conformity with any legal and regulatory requirements to decrease and avoid legal and regulatory issues. Anday, A., Francese, E., Huurdeman, H. C., Yilmaz, M., & Zengenene, D. (2012). Information Security Issues in a Digital Library Environment: A literature Review. Bilgi Dünyası, 13(1), 117-137. Kuzma, J. (2010). European Digital Libraries: Web Security Vulnerabilities. Library Hi Tech, 28(3), 402-413. Phillips, M.P. (2013). The NDSA Levels of Digital Preservation: An Explanation and Uses. This blog is a reflection for Fulton’s article “Web Accessibility, Libraries and the Law,” which discusses the limited accessibility of disabled users to web resources and the lack of law addressing this issue. At the beginning of this article, the author gave an example of a blinded student who is not accessible to a quiz. The quiz was designed online and the requirement for disabled students is not considered. Then, the author conducted a survey on the existing number of laws about web accessibility for disabled person and found out that there are no such laws that mandate libraries to provide equal access for disabled users to information through websites (2011). Visual disabled users perceive, operate and understand the web content and features by listening to the screen reader. Compared to traditional libraries, digital libraries are significant to blind users for its convenient convert of visual information to audio information. But like the example in Fulton’s article, a misuse of font tags may cause the screen reader’s bad interpretation (2011). What hinders blind people to use digital libraries? Lazer (2007) conducted a study on 100 blind users and identified their five frustrations on using web: complex page layout causing screen reader feedback; conflict between screen reader and web; low quality of designed forms; pictures without alternative text; and misleading links. We always emphasized the user-center design to increase web accessibility. I think Lazer’s research which addressed the problem from blind users’ perspective is very important. Meanwhile, I was not surprised about the research results. The five design problems commonly exist in most libraries’ web interface. But for digital libraries, library websites’ usability is the most important. 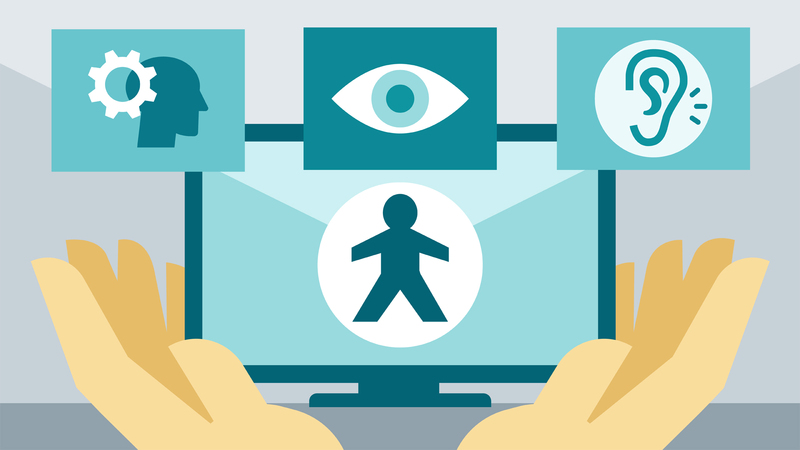 Kumar and Sanaman (2015) argued that wide-ranging images, hyperlinking and advertisements also damage the web accessibility for blind users. Advertisements are penetrating library in every aspect. Not only visual disabled users, all users suffer from them. There is no doubt that the screen reader is easily interrupted by an advertising or unable to read hyperlinks without meaningful labels. The sight-centered web design makes the digital library inaccessible for blind users. Therefore, based on Lazer’s and Kumar’s research, how can librarians do to create a blind-friendly digital library? In my opinion, it is important that we follow the two authoritative documents about web accessibility: The Web Content Accessibility Guidelines (WCAG) and the Web Accessibility Guidelines from Section 508 of the Rehabilitation Act. The laws can instruct us to increase websites’ accessibility. However, relying only on the laws is not sufficient to create websites and digital libraries that are blind users friendly. The most important is to design real user-centered websites. As librarians, we can find out blind users’ obstruction and speak out for them. For example, librarians can conduct research to address difficulties that blind users face in using library website and report the situation to web designers. In addition, librarians can conduct website usability survey on disabled users periodically. Through considering the problem from blind users’ perspective, I believe we can improve blind users’ experience on digital libraries. Fulton, Camilla. (2011) Web Accessibility, Libraries, and the Law. Information Technology & Libraries, Vol. 30 Issue 1, p34-43. Kumar, S. Sanaman, G. (2015) Web Challenges Faced by Blind and Vision Impaired Users in Libraries of Delhi. The Electronic Library, Vol. 33 No. 2 242-257. Lazer, J. Allen, A. Kleinman, J. Malarkey, C. (2007) What Frustrates Screen Reader Users on the Web: A Study of 100 Blind Users. International Journal to Human-Computer Interaction, Vol. 22 No. 3. 247-269. At the end of the last century, as people were trying to define what a digital library is, copyrights were labeled as “the single most vexing barrier” to create digital libraries (Chepesuik, 1998). It is well known that copyright law was created in the context of paper. The violation of copyright frequently occurs especially in computer and digital environment. However, while we are trying to protect the copyright, how to guarantee the public access is also important. It seems to be a conflict between copyright protection and public access. In order to make a balance between protecting the right of authors and protecting the right of public, digital libraries are facing more challenges. McDermott explored this issue and argued that deteriorating the conflicts between ownership and licensing of digital items and hindering library digitization programs are the two main challenges (2012). I stand firmly with McDermott for the following two reasons. First, copyright worsens the conflict between ownership and licensing of digital collections and content. In the past, libraries bought books and owned the copies. But now, libraries pay licensing fees through signing in contract with e-book vendors. They do not own e-books. E-books vendors can limit libraries’ licensing right easily through the contract. This makes e-books even more difficult to manage. Also, publishers own high level of control over digital content (Charles & Bailey, 2006). For example, an academic user can only read a scholarly paper in two weeks. If the user wants to continue viewing that paper or copy or download it, the only thing the library can do is to pay higher licensing fees to extend the time or gain more rights. For this situation, I want to share my own experience. Last week, I found an e-book related to one of my final paper topic. I tried to download the book but was refused. I can only read the book on the database site. This week I wanted to continue reading the book, and my access was denied because another user was using the book. See how easily publishers can control the access to e-resources. Second, librarians are more easily to infringe copyright in digital libraries or developing digital collections. For instance, librarians often digitize physical collections in order to preserve or open access. If the librarian has not gotten permission from publishers before scanning the items, he or she can not do anything to items published after 1922 (Librarylaw.com). So, facing the challenges, how digital libraries can distinguish themselves from other providers of digital items especially commercial providers? One thing that libraries can do is to support users’ fair use right under the copyright law. For example, libraries can unite to provide electronic items distribution services. Commercial organizations should pay royalty fee to use the service and libraries are allowed to make fair use of material without paying a royalty fee. Libraries can have an advantage over commercial institutions by making most use of fair use. Chepesuik, R. (1998) The Future is Here: America’s Libraries Go Digital.